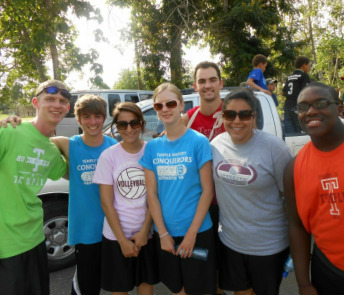 Each summer, our youth group takes two missions trips. Teens who want to go on these trips must earn their way by accumulating points for service activities, devotions, faithfulness, and bringing visitors. Finances are provided by the church missions fund and the teens send out letters to get sponsors. 'B' TRIP: A second missions trip for younger teens is usually to another state to help a church planting effort or to run a Vacation Bible School. This year's trip was to North Carolina to help a church. The basic idea is for teens to get involved in missions. It's life-changing.